224 pages | 10 B/W Illus. The literature of marketplace behaviour, long dominated by economic and psychological discourse, has matured in the last decade to reveal the vast expanse of consumption activity not adequately addressed – in either theoretical or empirical perspective - by the discipline's favoured approaches. The lived experience of consumption in cultural and historical context, rendered in a fashion that is both intellectually insightful and authentically evocative, and that recognizes the dynamics of accommodation and resistance that characterize the individual's relationship with the market, is the central interpretive thrust of an emerging interdisciplinary field inquiry broadly labelled "consumer culture theory." In this volume, some of the leading scholars of this field explore in great empirical detail and theoretical depth the relationships that the consumer has developed both with goods and services and with the stakeholders that animate markets. Beginning with an examination of the underpinnings of cultural inquiry, the focus then shifts to specific consumption venues. Analyses of advertising in personal, critical and historical perspective, examination of lifestyle trends from dwelling practices of transnational nomads and regimes of personal training to genetic testing and gambling, interpretations of the dynamics of brand loyalty and corporate image management, and investigation of family consumption rituals are among the topics explored in ethnographic and humanistic perspective. The role of culture in consumption has been long acknowledged, but related research has been fragmented and under-appreciated. 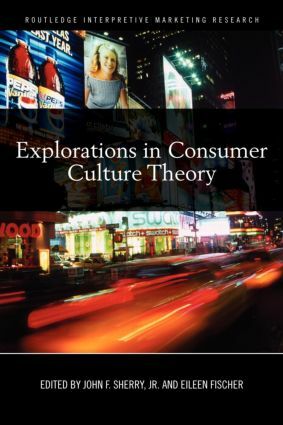 This volume, with its impressive line-up of topics and authors, will play a vital role in the development of Consumer Culture Theory as the well-spring from which new and deep understandings of the consumer world are emerging. Consumer Culture Theory is not a theory. It is much more. It is the future of research about consumers, markets, and business. The settings for the research and reflections presented here are fascinating in and of themselves: DNA testing, home away from home, Wal Mart, Christmas trees, personal trainers, gambling casinos, advertising, dolls, and poetry. But even more stimulating are insights into basic human issues addressed in these chapters. They include: Who am I? Where do I come from? What can I become? What is home? What is family? What is ritual in contemporary consumer society? How does gambling emancipate us from the market? What is Consumer Culture Theory? And how has advertising shaped culture and brought order to the world? This is a book that will fascinate, stimulate, and provoke new ways of seeing the world of the consumer. It is about a very vibrant and fresh perspective on consumption that has emerged in the past three decades and clearly has come of age. CCT is AOK. This book brings together some of the most effervescent thinking in Consumer Culture Theory. It is the Sprite of scholarship - refreshing, invigorating and deliciously subversive. Covering everything from Christmas trees to DNA tests, Sherry and Fischer's volume sparkles with smarts and spirit and sugar-rush subversion. Image may be nothing but imagination is everything. Exploring Consumer Culture Theory is intoxicatingly imaginative. Enjoy. This book is an exploration of new ideas, new topics, new ways of thinking and writing. It will bring bright light and some heat to the debate. Exploring Consumer Culture Theory is an important step forward. This second installment (of what one hopes will be many) of Consumer Culture Theory (CCT) conference papers delivers on CCT's promise of pluralism – in directions, inclusions, articulations, applications, theoretics and poetics. It is a must-read for marketers or social scientists with an eye on consumption. This volume invites and incites. Eileen Fischer and John Sherry have put together a fine collection of writings from talented contributors whose insights and deft analyses demonstrate, in a variety of ways, how consumption informs and is informed by meaning-making practice. A delightful read, this work promises to invigorate the already lively field of Consumer Culture Theory by situating culture squarely in the crux of consumer research. Introduction, Explorations in Consumer Culture Theory: What Are We Exploring Now?, Eileen Fischer, and John F. Sherry, Jr., Section One: Forming and Framing, From CCT to CCC: Building Consumer Culture Community, Johanna Moisander, Lisa Penaloza and Anu Valtonen, Theoretical Realism: Culture and Politics in Commercial Imagery, Linda M. Scott, Section Two: Time and Space, Banking on History: Reflections in the Archive Mirror, Barbara Olsen, Dwelling in Mobility: Homemaking Among Mobile Professionals, Fleura Bardhi and Søren Askegaard, Section Three: Setting and Self, Are We There Yet? Coproducing Success and Failure in Personal Training, Eileen Fischer, Cele C. Otnes, Brynn Winegard, Eric Li and Sarah Scarbrough-Wilner, Designer Genes: DNA Testing Services and Consumer Identity, Elizabeth C. Hirschman and Donald Panther-Yates, Section Four: Brands and Images, Allomother as Image and Essence: Animating the American Girl Brand, John F. Sherry, Jr., Stefania Borghini, Mary Ann McGrath, Albert Muñiz, Nina Diamond and Robert V. Kozinets, Engineering a Mainstream Market for Sustainable Practices, Diane M. Martin and John W. Schouten, Section Five: Rites and Games, Tinsel, Trimmings and Tensions: Negotiating a Focal Artifact, Cele C. Otnes, Elizabeth Crosby, Robert Kreuzbauer and Jennifer Ho, Stacking the Deck; Gambling in Film and the Diffusion of Casino Gambling, Ashlee Humphreys, Section Six: Poetry, Living Things, Small Things, John W. Schouten, Heading Home, Consumption Kaddish in Four Koans, John F. Sherry, Jr., Haiku for EATNIKS, Eugene Halton, Imagined (Musical) Experiences: Across Four Centuries, George Zinkhan, Conclusion, Reflections and Revanche, John F. Sherry, Jr. and Eileen Fischer. John F. Sherry Jr. is the Herrick Professor of Marketing and Department Chair at the Mendoza College of Business, University of Notre Dame in Indiana. Eileen Fischer is the Max and Ann Tanenbaum Chair in Entrepreneurship and Family Enterprise at the Schulich School of Business, York University in Toronto.